We depart from Los Angeles this morning and drive to Santa Barbara, the "America’s Riviera!" Enjoy beautiful scenery of the Pacific Coastline along the way. The new Mediterranean and Old Spanish style Architectures are surrounded by flowers and lawns; this little Central California Coastal City is one of the most popular vacation destinations. Then we drive to Solvang, Danish for "Sunny Field!" The cozy small town is dominated by Danish style architectures and known for warm sunshine year-round. Next, we travel to the Icon of America’s High-Tech Sectors – Silicon Valley. Home to world’s most famous high-tech companies, Silicon Valley is also the region of highest personal income, highest housing costs, and highest concentration of millionaires and billionaires in America. Welcome to the newly opened ‘spaceship’ campus at a cost of 5 billion dollars. The visitor center features best view of Apple Park and a store serves apple branded merchandise. Stay overnight in Bay Area. 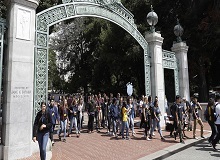 In the morning we visit the campus of UC Berkeley. From the nostalgic campus, the Golden Gate Bridge and Golden Gate Straight can both be seen! Afterwards we drive to San Francisco, home to over 50 rolling hills and surrounded by water on 3 sides. Take a cable car ride (Mandatory), known as “the only Mobile Monument of America,” and enjoy the city view. Then we visit the Golden Gate Bridge and Fisherman's Wharf. Here you can take an optional sightseeing cruise tour on the San Francisco Bay (own expense). Next, we visit Madame Tussaud or Exploratorium and then we'll visit the only building remaining from 1915 world’s exposition, the Palace of Fine Arts. You may join an optional advanced city tour in the afternoon. Stay overnight in Marina Monterey or San Francisco Bay Area. Head to the picturesque Monterey Peninsula this morning, gentle sea breezes, meandering coast, surging waves, bizarre rocks, adorable seals and sea lions rest on the beach; world’s first-class golf courses stretch beyond shiny multimillion dollar mansions… Scenery of 17 Miles is truly breathtaking. Ensuing surprises come one after another and simply indulge yourself in this poetic land. To all Monterey’s visitors, the world’s famous Aquarium is a must-see. You can visit Aquarium at your own expense. 650 species of marine life including colorful fishes and deep-sea monsters, all call the Aquarium home, and seagulls flying high above! Enjoy your day in the charming Monterey! 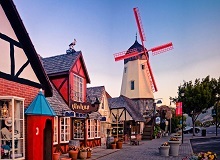 Return to Los Angeles in the evening and finish our pleasant 3-day San Francisco, UC Berkeley and Solvang 3-day tour! Mandatory $40 to include: 17-Miles, Berkeley University, Madame Tussauds, Wax Museum, fuel surcharge.